Beginner VBA enthusiasts often get confused as how to address a control on a Form or on Sub-Forms. It becomes more difficult when there is an inner-form within a Sub-Form. Specifying the address of the control on the inner sub-form correctly will only help to access the Text control's contents or to set the control's value directly through VBA. How, to join each element of the address? Join each element with dot (.) or is it exclamation mark (!) or both? Let us start with the simple usages of dots and exclamation marks in object specifications. I have designed a sample Main Form and two Sub-Forms. The second sub-form is inside the first Sub-Form. 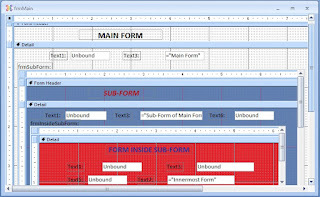 The Forms design view and normal view images are given below for reference. General Usages of dot (.) and exclamation symbol (!) in object references. dot (.) - used after an object name to access it's methods or properties. exclation mark (!) - used after an object name to refer to the sub-object/control of the Top-level Object. All the three forms are designed without linking to any Table (all form's Record Source Property is empty). 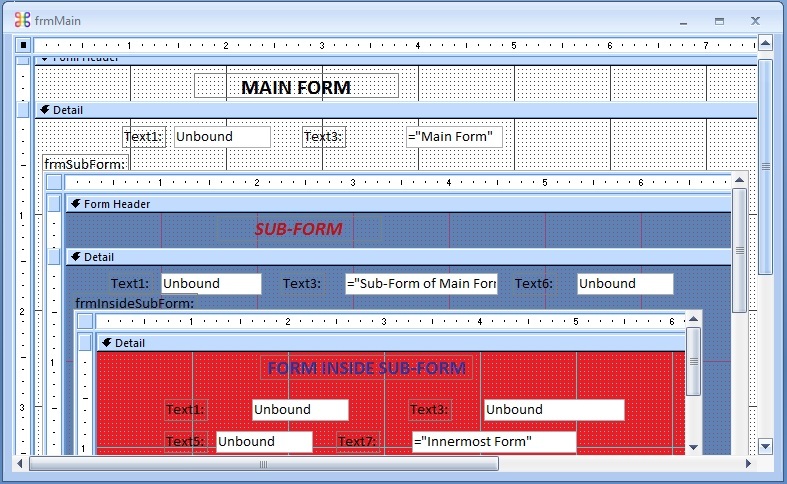 All the Text controls on the Form are unbound. You may design three sample forms with few unbound text boxes and set them up one inside the other and open it in normal view. Open VBA editing Window and open the Debug Window (Ctrl+G). Now you are ready to try out the following examples after typing the code directly on the Debug Window and pressing Enter Key. First, we will try to read the contents of Text7 textbox (i.e. 'Innermost Form') from frmInnerSubForm and display the result on the Debug Window. I have written an expression ="Innermost Form" inside the Text7 Text box, that is displayed in the Debug Window. Result: Text3 textbox of the Innermost Form is assigned with the text: ms-access. Check on your opened Form after executing the above statement on the Debug Window. Let us examine each part of the above command joined by exclamation mark or dot. I call this a command because we directly execute this program statement in the Debug Window, with the ? (Print VBA command). Forms : Collection of all Forms loaded in memory. All Forms opened in memory are indexed in the order in which they are loaded into memory, i.e. first form opened will have the index number 0, second form is 1 and so on. 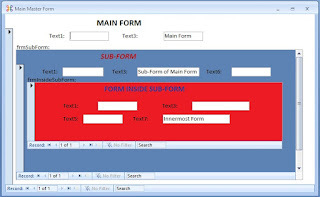 If your main form have two more forms on it as Sub-Forms they are treated as controls of the Main-form, like any other control (combobox, labels, textbox etc.). They will not appear as a separate form in the Forms collection. We can display the name of the first open form in memory with the following command using zero as it's index number and printing it's Name Property Value. Result: frmMain - Form's Name property value is printed. Result: 21225 (you will get a number similar to the one given to the left) - the width of the form given in the measure of Twips. 1 Inch = 1440 twips. VBA converts the value you set in the Width Property of the Form in Inches or Centimeters or any other regional value it will be converted into twips. In this form of command Form's name can be given as a string in parenthesis. In this command, immediately after the Forms Collection name we have used the ! symbol to give the name of next level of object of the Forms collection object, not a property or method. The next item Width is a property of the frmMain object, so a dot is required, not the other symbol. 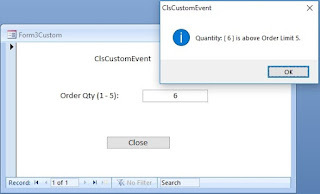 In the above statement we have called the Count() Method of the Forms Property to take a Count of properties of the first form open in memory and print the Name of each Property, one by one. Note the usage of Forms("frmMain") and !frmMain, two different ways to refer to the frmMain object of the open Forms Collection Object. In both cases form's name is given immediately after the open Forms collection name. But, frmMain form is not open at the time of executing this statement it will end up with Error. Forms(0) refers to any form that is open first in memory. It will fail only when no form is open at the time of executing this statement. We will explore this topic further in the next Post.